The Android and iOS sportsbooks featured on this page are at the cutting edge of betting technology. They offer so much more to the average punter than straightforward betting. For example, if you are a Manchester United or Barcelona F.C. 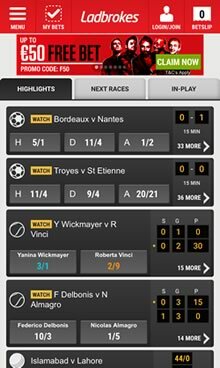 fan you can now customize the bookie apps to feature the latest betting odds, team news and videos of your favourite team. In addition to providing a wide range of In-Play and Pre-Match markets, these iPhone and Android bookmakers offer a Cash Out option to better help you manage your bets. Live streams of the English Premier League soccer, NBA basketball and major golf/tennis tournaments are provided free of charge. It is even possible to get the latest scores, check odds and wager from smartwatches like the Apple Watch. US sports fans should visit our U.S. Sportsbook Apps page. ​This is our list of the Best Australian Bookmaker Apps. Newly redesigned to offer the best football betting experience on Android. Real time statistics and visualizations available on thousands of live sports. The new Android app has been streamlined for a better betting experience. Cash-out on mobile is now available, making it easy to pocket your profit. Placing a bet on multiples is quick and easy via the updated coupons section. New quick PIN login system allows you to login and place a bet in seconds. Place a £1 bet on any horse race to watch it live on your Android smartphone. Get access to exclusive horse race betting content, including tips and stats. All of their famous "Money Back Specials" are available via the Android app. Strong focus on UK racing and soccer, including English Premier League. Follow trending markets via "Top Bets" that shows where people are betting. Track wide range of sporting events in real-time with live statistics and graphics. Supports Apple Watch plus iOS, Windows Phone, BlackBerry and Android. Wide range of constantly updating bonuses, cash-backs and free bet offers. View the "Top 10 Backed Horses" to quickly view horse racing betting trends. 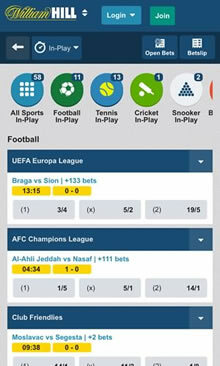 Configure the William Hill app to notify you of betting promotions and free bets. The William Hill app offers more in-play betting markets than any other bookie. When you place a bet of £10 William Hill will give new users a £20 free bets. Watch live soccer from Spain/Italy & NBA basketball for free on your phone. Live statistics and animations of games available for in-play betting fans. Cash Out on bets early from your phone to cut losses or lock in your profit. Create football coupons via the app and track the progress of accumulators. 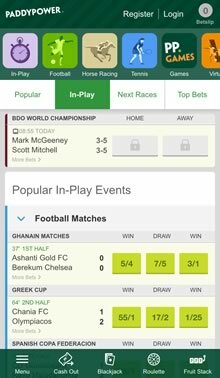 "Quickbet" option lets you place singles bets with a single click via the app. Set-up push alerts so you never miss a free bet offer or promotion again. Watch live greyhound and horse racing from racetracks in the UK and Ireland. When you place your first wager Ladbrokes will match the bet up to £50. With the rapid rise of iOS and Android smartphones, most web services and platforms are now available to us all the time. The betting industry is not an exception as most gambling operators quickly developed their very own mobile applications or, at least, made their websites responsive. This was a game-changer in the world of online betting as now anyone can place a wager on the go. Here’s a list of the biggest advantages of mobile betting. Thanks to HTML5 there are now a growing number of United States Android sportsbooks. The most obvious one is you can place your bets at any point in time. This means that as soon as you decide what you want to do, you can do it. It’s that simple. You won’t have to wait to get access to a computer and risk losing a potential edge. Whether the odds for a certain event will drop or it will start and you’ll miss it, this is now in the past. Just use your phone or tablet and you’re done. Additionally, most iPhone bookmaker applications support banking. That allows you to deposit money instantly and never miss a game. Live betting has never been easier. Just open the app, select the market, and confirm. You can bet on an event you’re attending or while you’re with your mates at the local pub. Android sportsbooks also provide plenty of useful stats and live updates, so you could make a well-informed decision. Even Australian mobile bookmakers are now legally allowed to accept in-play bets. Another huge advantage is that lots of gambling operators provide live streaming directly on your phone or tablet. Usually, the only condition is to have some money in your account. You can watch all kinds of sports, including football, rugby, soccer, basketball, volleyball, horse races, snooker, and many more. Even if you don’t intend to place a bet, this is still pretty cool. All bookmakers are trying to get as many customers as possible to use their Android gambling service. The fierce competition is great for the customers as there are many promotions. Free bets, deposit bonuses, odds enhancements, money backs, and other cool offers are there for mobile customers. Most of these are available from phone or tablet only. Check your preferred bookmaker’s promotions page and make sure to take advantage. Additional value provides the Cash Out feature that most sportsbooks have recently implemented. It gives you more control over your bets as you can settle them at any given moment. You surely know that feeling when your team is winning, but there’s too much time and the pressure is building? Now you can spare yourself the nerves and cash out earlier. Most bookmakers made sure to include this option in their Android version. This means full control from the comfort of your phone. Mobile betting on Apple iOS and Google Android is surely a step forward for every gambler out there. It provides additional value in terms of promos and features that are available at any given point. It seems this is just the beginning as most bookmakers are constantly improving their service.